As we leave our eastern capers firmly engrained along the Gwynedd coastline, we now set the tone for HF6 with a return to Ancient Egypt some 5000 years earlier. Our encounter marks a new pre-dynastic back drop of Egyptian culture, mixed with an historical tale of two Egyptian Gods, one being the jackal headed lord of the afterlife, Anubis and the other, the hawk headed God of War, Horus. With no fields, no dodgy weather. your own quality gaffs with fully equipped toilets, TV, Fridges, heating n showers in tow,.. or if campervans is your thing and everything within a stones throw from the arenas and fun. Rest assured you will have the full Metal spectrum catered. 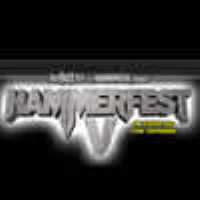 Hammerfest lets have you! Check in open from 11am, see you all soon!